All our campsite pitches, Nature or Comfort, either in the shade or sunny, are 100 to 120 m² and have a grass soil. All pitches are equipped with drinking water, electricity (10 Amp, you need the bleu European plug) and drain. You are assured of peace and spacious sites. We have also created our 2 new Premiun Pitches with a surface of 140 m², 16 Amp. electricity with blue European plug. On the premium spots you’ll find a cabin with a refrigerator, a micro-wave, a barbecue and a drying rack. Among the large pergola on the wooden terrace you can just enjoy the large table and fitted benches. In our heated, comfortable sanitary you’ll find family showers (with shower and sink), a hair dryer and a baby room with baby bath. The toilets are equipped with toilet paper, soap and a hand dryer. In order to provide the building with hot water, we make use of solar panels. You’ll even find a room for hand washing and dish washing, all with hot water. Our children’s room with shower, sink and toilet is really appreciated and often used by our small visitors. For our disabled guests there is adapted sanitary with shower, toilet, sink and dish washing sink. Barbecue is allowed with charcoal and gas barbecues. Electric barbecues are forbidden. There are common barbecues too on the campsite. We don’t accept ice blocks to freeze. 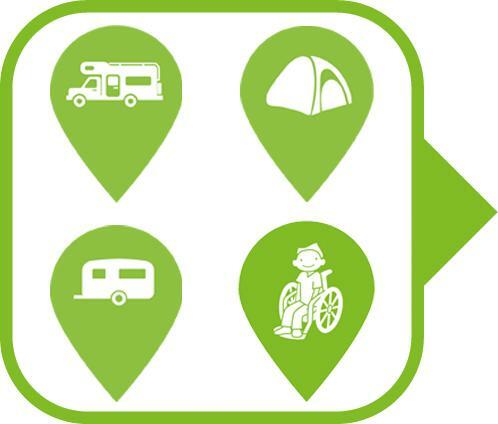 For guests which are camping with a motorhome there is a special equipped service point, where you can take fresh water and empty your waste water and you chemical toilet.